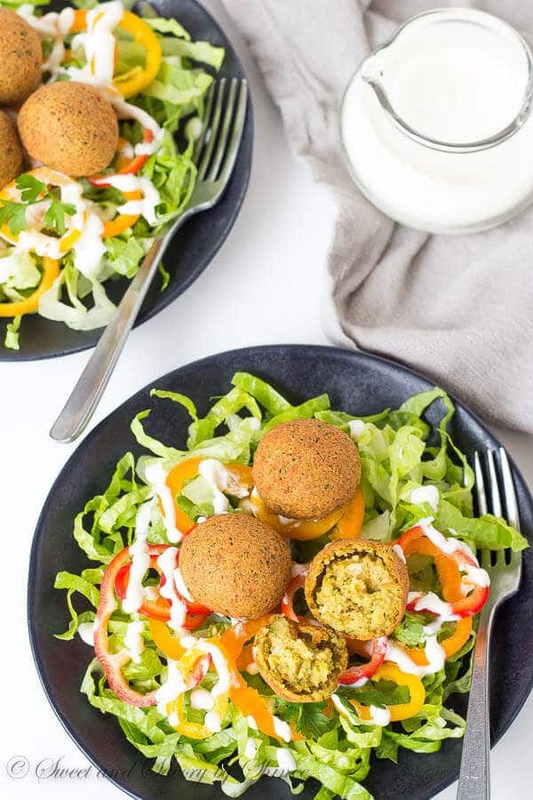 Simple satisfying salad, loaded with flavorful falafel balls and smothered with tangy Greek yogurt dressing. Customize yours with your favorite leafy greens and toppings. It’s delicious summer lunch! But now I have a 4-month-old and things have changed to say the least. I wouldn’t change a thing though. I’m happy to be snuggled with my little man at home all day every day. To satisfy my travel cravings nowadays, I scroll through my photos and cook something that brings back memories. And today’s seemingly simple salad is inspired by my trip to Paris, where I devoured my very first falafel on a busy Parisian street surrounded by french. Fun times! Truth to be told, it’s not common for us, meat-loving ranchers, eat vegetarian meal and be satisfied. But this falafel balls are different story. They’re flavorful, filling and so versatile! Remember that time I shared these falafels as appetizer? Today, they’re added to my salad. So as with any salad, you can load yours with whatever veggies your heart desires. Maybe variety of leafy greens, like butter lettuce (my fave), romaine, spinach, arugula, whatever you have in the fridge. I’ve been on mini sweet pepper kick lately, so naturally they made it into the bowl. You can also top yours with cucumbers, tomatoes, bell peppers, you got the idea, anything works here. I feel like mine here is the simplest of all, but that’s all I had on hand. I’m telling ya, it works! Lastly, load up on those delicious falafels. 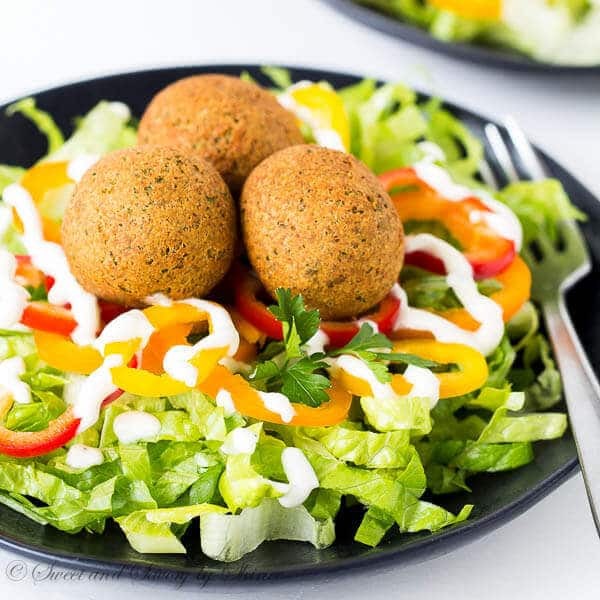 I’ve discussed all the details and step by step photos on how to make falafel here, so I won’t repeat myself. I promise they’re quite easy to make. Oh that hot n’ crispy, fresh-out-of-fryer crust is the BEST! Hope you’ll give this salad a try this spring and summer. If you do, let me know how you customized yours. And as always thanks for reading! 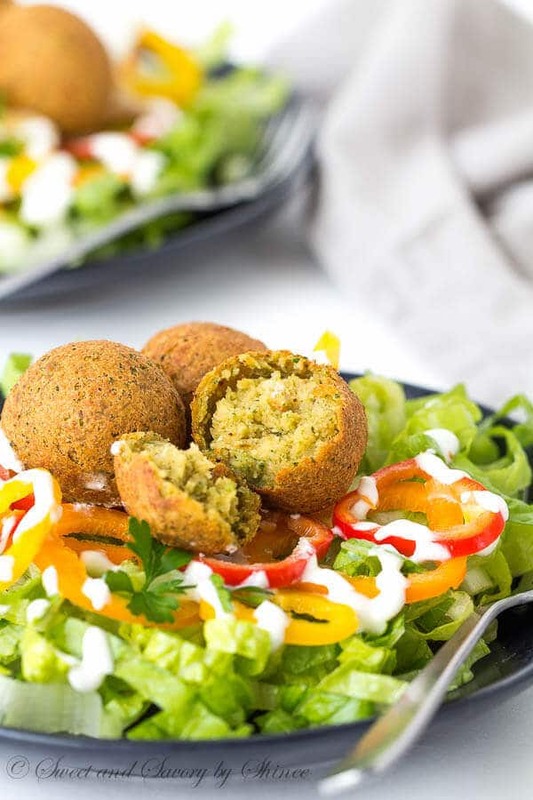 To make falafel, in a food processor, place all the ingredients for falafel, except for oil, and pulse until the mixture is smooth. Heat the oil (at least 2 inches deep) till 350°F (175°C). Fry the balls until nice and golden brown, 6-8 balls at a time, for about 3 minutes. Make sure the oil temperature doesn’t drop below 350°F (175°C), or falafel balls will fall apart. Remove the balls onto a baking sheet lined with paper towel and wire rack, so that they stay crispy longer. To make the dressing, in a small dish, mix Greek yogurt, olive oil and lemon juice. Salt and pepper to taste. To assemble the salad, plate thinly sliced Romaine lettuce and sweet peppers. 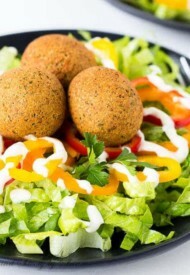 Top with few falafel balls and drizzle the dressing.